This is a general introduction for visitors to Wikipedia. The project also has an encyclopedia article about itself, Wikipedia, and some introductions for aspiring contributors. For information on how to donate to the organization that runs Wikipedia, see Ways to Give. See also: Wikipedia:FAQ and Wikipedia:Citing Wikipedia. and 39,661,544 pages in total. There have been 836,566,742 edits. There are 853,019 uploaded files. Wikipedia ( i/ˌwɪkᵻˈpiːdi.ə/ or i/ˌwɪkiˈpiːdi.ə/ WIK-i-PEE-dee-ə) is a multilingual, web-based, free-content encyclopedia project supported by the Wikimedia Foundation and based on a model of openly editable content. The name "Wikipedia" is a portmanteau of the words wiki (a technology for creating collaborative websites, from the Hawaiian word wiki, meaning "quick") and encyclopedia. Wikipedia's articles provide links designed to guide the user to related pages with additional information. The English edition of Wikipedia has grown to 5,183,995 articles, equivalent to over 2,000 print volumes of the Encyclopædia Britannica. Including all language editions, Wikipedia has over 38 million articles, equivalent to over 15,000 print volumes. Several mechanisms are in place to help Wikipedia members carry out the important work of crafting a high-quality resource while maintaining civility. Editors are able to watch pages and technically skilled persons can write editing programs to keep track of or rectify bad edits. Where there are disagreements on how to display facts, editors often work together to compile an article that fairly represents current expert opinion on the subject. Many visitors come to Wikipedia to acquire knowledge, while others come to share knowledge. At this very instant, dozens of articles are being improved, and new articles are also being created. Changes can be viewed at the Recent changes page and a random page at random articles. Over 4,500 articles have been designated by the Wikipedia community as featured articles, exemplifying the best articles in the encyclopedia. Another 22,000 articles are designated as good articles. Some information on Wikipedia is organized into lists; the best of these are designated as featured lists. Wikipedia also has portals, which organize content around topic areas; our best portals are selected as featured portals. Articles can be found using the search box on the top-right side of the screen. Users should be aware that not all articles are of encyclopedic quality from the start: they may contain false or debatable information. Indeed, many articles start their lives as displaying a single viewpoint; and, after a long process of discussion, debate, and argument, they gradually take on a neutral point of view reached through consensus. Others may, for a while, become caught up in a heavily unbalanced viewpoint which can take some time—months or years perhaps—to achieve better balanced coverage of their subject. In part, this is because editors often contribute content in which they have a particular interest and do not attempt to make each article that they edit comprehensive. However, eventually, additional editors expand and contribute to articles and strive to achieve balance and comprehensive coverage. 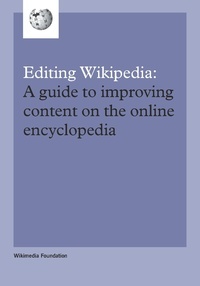 In addition, Wikipedia operates a number of internal resolution processes that can assist when editors disagree on content and approach. Usually, editors eventually reach a consensus on ways to improve the article. Main article: Wiki is not paper, on Wikimedia Meta-Wiki. Wikipedia has advantages over traditional paper encyclopedias. First, is that it is not limited in space: it can keep growing as fast as people add to it. Second, there are no qualifications required to be able to author its articles. Therefore, it has a very large pool of contributors: the whole world. These two aspects have enabled Wikipedia to become the most comprehensive encyclopedia on Earth. Third, a paper encyclopedia remains static (stays the same) and falls out of date until the next edition. But Wikipedia is dynamic: you don't have to wait for the next edition to come out (there are no editions), as Wikipedia is published on-line as it is written (also on-line). Articles are made available as is, regardless of what stage of development they are in. You can update Wikipedia at any instant, and people do so continually around the clock, thereby helping each other to keep abreast of the most recent events everywhere and of the latest facts in every subject. Fourth, Wikipedia has a very low "publishing" cost for adding or expanding entries, as it is on-line, with no need to buy paper or ink for distribution. This has allowed it to be made available for free, making it more accessible to everyone. This has enabled Wikipedia to be independently developed and published in many different languages at the same time, by people literate in each language. Of the 280+ different language Wikipedias, 132 of them have 10,000 or more articles. Wikipedia, in common with many websites, has a disclaimer that, at times, has led to commentators citing these in order to support a view that Wikipedia is unreliable. A selection of similar disclaimers from places which are often regarded as reliable (including sources such as Encyclopædia Britannica, Associated Press, and the Oxford English Dictionary) can be read and compared at Wikipedia:Non-Wikipedia disclaimers. Wikipedia content advisories can also be found here. See also Wikipedia:Starting an article. Guide to fixing vandalism: Help:Reverting. Normally editing is chosen by clicking the Edit tab at the top of a Wikipedia page (or on a section-edit link). This will take you to a new page with a text box containing the editable text of the page you were viewing. In this box, you can type in the text that you want to add, using wiki markup to format the text and add other elements like images and tables. You should then press the Show preview button to review your contributions for any errors. When you have finished editing, you should write a short edit summary in the small field below the edit-box describing your changes before you press the Save page button. This will help others to understand the intention of your edit. To avoid accidentally leaving edit summaries blank, you can select "Prompt me when entering a blank edit summary" on the Editing tab of your personal preferences. Stewards are the top echelon of technical permissions. Stewards can do a few technical things, and one almost never hears much about them since they normally only act when a local admin or bureaucrat is not available, and hence almost never on the English Wikipedia. There are very few stewards. Help:Contents/Directory—is a descriptive listing of all Wikipedia's informative, instructional and consultation pages. There is an established escalation-and-dispute process within Wikipedia, as well as pages designed for questions, feedback, suggestions, and comments. For a full listing of the services and assistance that can be requested on Wikipedia, see Wikipedia:Requests. For a listing of ongoing discussions and current requests, see the dashboard. For specific discussion not related to article content or editor conduct, see the Village pump, which covers such subjects as announcements, policy and technical discussion, and information on other specialized portals such as the help, reference and peer review desks. The Community Portal is a centralized place to find things to do, collaborations, and general editing help information, and find out what is happening. The Signpost, a community-edited newspaper, has recent news regarding Wikipedia, its sister projects, and the Wikimedia Foundation. To contact individual contributors, leave a message on their talk page. Standard places to ask policy and project-related questions are the Village Pump, online, and the Wikipedia mailing-lists, over e-mail. Reach other Wikipedians via IRC and e-mail. This Wikipedia is written in English. Started in 2001 (2001), it currently contains 5,183,995 articles. Many other Wikipedias are available; some of the largest are listed below. This page was last modified on 23 April 2016, at 20:04.